Internationally renowned marine oil and lipid chemist Robert G. Ackman died in Dartmouth, Nova Scotia, Canada on July 16, 2013, at the age of 85. He had been a member of AOCS for 46 years. He is survived by his wife Catherine, his daughters Elizabeth and Margaret, four grandchildren, and his sister. Born in Dorchester, New Brunswick, Ackman completed his B.A. 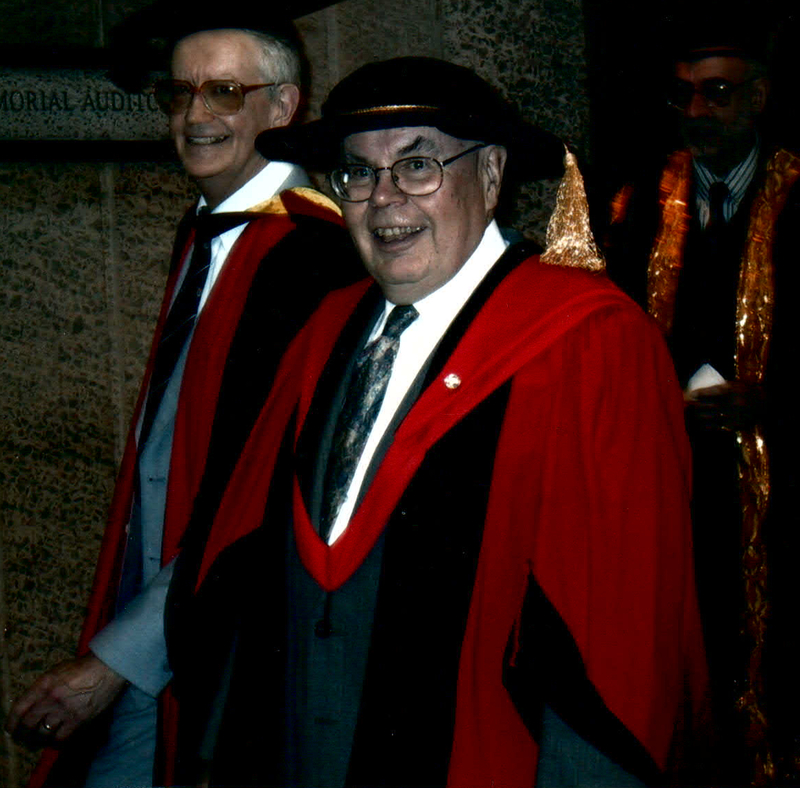 degree in organic chemistry at the University of Toronto in 1950, his M.S. in organic chemistry from Dalhousie University in 1952, his Ph.D. in organic chemistry from the University of London (England) in 1956 and a D.I.C. (Diploma of the Imperial College, London, England) in organic chemistry. At Imperial College, he was introduced to “vapor phase chromatography (VPC)” (as gas-liquid chromatography, or GLC, which had been developed only a couple of years previously, was then known) and he saw its potential for fatty acid analysis. Ackman started his career in marine oils in 1950 as a research chemist at the Halifax Laboratory of the Fisheries Research Board of Canada. In 1979 he helped establish the Canadian Institute of Fisheries Technology and later the Department of Food Science and Technology at the Technical University of Nova Scotia (TUNS; since April 1997 a part of Dalhousie University). In 1995, he was appointed Professor Emeritus. Ackman is best known for his pioneering work on lipid analytical chemistry, particularly in the capillary GLC of fatty acids and the chemistry and biochemistry of marine lipids. He edited the classic text Marine Biogenic Lipids, Fats and Oils, Volumes I and II (CRC Press, 1989) and was author on over 550 scientific papers. His work in the early 1960s established the relationship between the retention time of fatty acid methyl esters and their structure on GLC columns of different polarity, and on the response of the flame ionization detector to fatty acid structure, thus providing a mechanistic basis for both the qualitative and quantitative analysis of fatty acids. He developed a number of techniques and procedures in the analysis of marine oils especially the omega-3 fatty acids of fish oils, that are now widely used to analyze complex fatty acid mixtures from marine organisms. Through his expertise in fatty acid analysis Ackman played an important role in the development of low-erucic acid rapeseed oil (canola oil). Members of AOCS were well served by Dr. Ackman’s skills and knowledge. He was an associate editor for Lipids from 1980 to 2006, and he reviewed articles for the Journal of the American Oil Chemists’ Society as well. He participated in the activities of the Health and Nutrition Division and the AOCS Canadian Section, and he served as a member-at-large of the AOCS Governing Board from 1989 to 1991. He received the Supelco–American Oil Chemists’ Society Award in 1994 for original research in fats, oils, lipid chemistry, or biochemistry. The International Society for Fat Research presented Ackman with its H.P. Kaufmann Memorial Lecture Medal in 1980. He received an honorary Doctor of Laws degree from Dalhousie University in 2000; and in 2001 he was made an Officer of the Order of Canada, in recognition of his outstanding level of talent and service to Canadians. Ackman also received Canada’s Diamond Jubilee Medal in 2012. Anthony Bimbo is a consultant in marine oils, marine protein, and omega-3 oils in Kilmarnock, Virginia, USA. He may be contacted at apbimbo@verizon.net. When a friend or family member passes away you go through a period of sadness, which is a normal part of grieving. You progress to thinking about all the good times and memories you have of the person, lingering over the delights. These are some of the memories I have of Bob Ackman. The dates and chronology may not be exactly right but it is what I recall. I first met Bob in the late 1960s when he was still with Fisheries and Oceans Canada (Fisheries Research Board of Canada) in Halifax, Nova Scotia. I was a chemist with one of the fishmeal companies in the USA and was tasked with the responsibility for operating our F&M Model 500 Gas Chromatograph. It was a large, bulky thing with a car battery as the power source and a packed column. The peaks of chromatograms were cut out and weighed to get the percentage of each fatty acid. In our case, since we had a tight budget and no copy machine, we measured the peaks to get the area of the triangle, added them together, and divided by the total. My boss had met or heard Bob speak at a conference and suggested that I go up to Halifax and meet with him. At that time taking a foreign trip was quite an honor. So I visited with Bob, toured his lab and office, and was amazed to see he had an integrator that automatically measured the area peaks. No measuring and calculating areas of triangles, no adding columns of numbers. We did not have an adding machine in the lab (there were no calculators), and we used slide rules to do the calculations. Bob’s office was another matter; it was cluttered, as most of our offices are today and mine still is. But he knew exactly where everything was and I am sure that if someone moved an item he knew it. He invited me to dinner at his home and I made a terrible blunder when I passed on the vegetables. His wife Cathy felt that it was a bad influence on their daughters. But that was finally forgiven when they visited Williamsburg, Virginia, and my wife pointed Cathy to the Outlet Mall where she purchased quite a few pairs of shoes. Our friendship and collaborations continued through the University tenure, the Canadian Institute of Fisheries Technology and finally Dalhousie University, emeritus status and well past his retirement. If I have one regret, it was that I didn’t make that one more call to see how he was doing after he finally left the University and worked from his home. Bob always had a grad student or assistant or colleague who happened to be doing the type of work that you needed and could provide the information or who could do the work. As we were developing the menhaden GRAS petition, we found some gaps in information that we needed filled—and he and his associates plugged that gap. His students and sabbatical visitors came from all over the world to work with him. He had a keen knowledge of analytical techniques and some have become standard methods today. His students worked on the measurement of antioxidant residues in farmed salmon, the effects of feeds on the fatty acid composition of farmed catfish, and characterization of the wide range of cis and trans isomers in partially hydrogenated menhaden oil. I was honored when he asked me to write a chapter for a book he was editing. Biogenic Lipids, Fats and Oils (2 volumes), published by CRC Press in 1989. The chapter (my first) was written with a manual typewriter and when it came time to make editorial corrections we literally re-typed a sentence or paragraph and then cut it out and pasted it over the original document, hence cut and paste. I’m not sure what Bob did. I know in later years when most of us moved into computers he was still writing things longhand and his writing was practically indecipherable. He never used email, although he did have an email account that was managed by the department secretary. He was an avid user of the copy and fax machines and there was always a cartoon tucked in with the papers. In fact, he was the only person who still sent faxes to me until he finally retired and left the University. I guess I can retire the machine now. I felt deeply honored when he asked me to co-chair an AOCS Short Course on Modern Applications of Marine Oils held in Toronto, Canada in 1992. He received the Earl P. McFee Award from the Atlantic Fisheries Technology Conference in 1973. Incidentally, two of his colleagues William Dyer and Graham Bligh also received the award in 1975 and 1983, respectively. They are the authors of the Bligh and Dyer Method for fat extraction, which is used universally today. He received many other awards over his long and illustrious career. When the Food and Agriculture Organization of the UN (FAO) and the World Health Organization (WHO) called for an expert consultation on the role of dietary fats and oils in human nutrition in 1977, Bob was invited. full of energy, and always ready to help or answer a question no matter how silly it was. He came into the fats and oils industry in its early days, prior to any mention of omega-3 fatty acids, and when he retired he left a lasting imprint on the field. You do not find a published paper dealing with marine oils that does not have one or more of Bob’s publications in the reference list. Bob was certainly a giant in the fish oil and omega-3 arena and he will be missed by all his friends, family and colleagues. Former AOCS President James Daun retired from the Canadian Grain Commission and is now an independent consultant. He may be contacted at jdaun@mymts.net. Bob liked to tell the story that his graduate supervisor had heard that a guy named A.T. James had invented this device that separated things in the gas phase and sent Bob over to England to have a look. Of course, the device was the first gas chromatograph. Bob said that he came back to his lab and went to work to build the world’s second gas chromatograph. From there he went on to be at the forefront of the use of this technique in lipid analysis, particularly fatty acids. I first met Bob through a package he sent me while I was an M.Sc. student at the University of Manitoba. I was studying methods for determining the amount of sulfur in rapeseed and canola oils. The package was delivered directly to our laboratory and went directly into a fume hood, as it had been damaged and was leaking a very evil-smelling oil. Apparently Bob had heard that there was a student looking into the problem of sulfur in rapeseed oil and he had prepared some oils to which he had added dimethylsulfide, the source of the smell, to see if I could really do the analysis. I called him by phone to confirm that his package had arrived damaged but that I would do my best to tell him how much sulfur was in the oil. When we finally met in person, perhaps at an AOCS meeting, we began a friendship that lasted many, many years. Bob also liked to clip interesting articles and to send them to people through the post. A few days after they arrived, he would call to see what you thought of the articles. It sure kept me up to date on what was going on in the lipid area. Richard Addison is retired from the Bedford Institute of Oceanography. He may be contacted at rfaddison@shaw.ca. I worked closely with Dr. Ackman between 1967 and 1971. I recall that he was a meticulous analyst: He always wanted at least three independent analyses of a sample before he would accept them. Usually, this involved running a fatty acid methyl ester sample on two columns of quite different polarity (and then trying to reconcile the results), and comparing the inferred fatty acid composition with a measured Wij iodine value (IV) to confirm the extent of unsaturation. After this, the sample would be hydrogenated catalytically, the saturated esters re-run for confirmation of the chain length distribution, and the volume of hydrogen consumed compared to the measured IV. Of course, none of these independent analyses gave absolutely comparable results, and one spent a lot of time trying to explain differences of 0.1% in fatty acid distribution. Then someone further complicated the process by inventing a method to separate classes of fatty acid methyl esters (saturates, monoenes, dienes, etc.) by complexing them with silver ions on thin layer chromatography. . . .
Ackman was not only meticulous; he was imaginative and versatile. He resolved stereoisomeric forms of some branched chain fatty acids by converting them to diastereomers by esterification with (–)-menthol, long before chiral stationary phases were developed. He was interested in “real” fisheries (and other) issues: In 1969, when industrial releases of white (elemental) phosphorus caused fish kills and related marine pollution problems in Newfoundland, he and I developed a method for its analysis that remains the standard method today. After I left Ackman’s lab, we continued to collaborate on such practical issues as the effects of fish oil processing on the removal or degradation of contaminants like DDT and PCBs. When “blackberry odor” affected the quality of some Newfoundland cod, he identified its cause as dimethyl sulfide arising from the breakdown of algal dimethyl-β-propiothetin. Ackman also developed a quick test to identify ambergris, a secretion of the sperm whale’s digestive system that, in the 1960s, was a valuable and expensive natural product used in the perfume industry. I remember beachcombers coming into the laboratory with several pounds of unattractive smelly material hoping to have made their fortune through an ambergris find, only to be disillusioned by Ackman’s analysis done on the spot. Initially, I think people found him a bit intimidating, not just because of his reputation, but because of his acerbic turn of phrase. But when you got to know him, you realized that he could laugh at himself, as well as his targets. Dave Matthews is general manager with Tasa Omega S.A., a subsidiary of TASA, in Peru. The company is gearing up to produce omega oil concentrates. He worked with Ackman for five years. He may be contacted at dmatthews@tasaomega.com. I started working with Dr. Ackman in August 1982 as a laboratory analyst assistant, right after I completed undergraduate work at Nova Scotia Agricultural College. My first assignment was working on a two-year contract involving GLA [γ-linolenic acid] research for Efamol Ltd. The field was new at the time, and I put the pilot plant together for scale-up of GLA production. This was 15 years before production of omega-3 and omega-6 fatty acids really became commercial, and being in on the ground floor of a new industry with Dr. Ackman was a unique experience for me. He was the first to report on using wiped film molecular evaporators on fish oil. These are now the industry standard for obtaining omega-3 fatty acids. One thing about working for Dr. Ackman—“You got some really weird assignments.” One of my earliest unusual ones was to collect dead snapping turtles. Conservation officers in southern Nova Scotia were collecting turtles killed by cars on the province’s roads. Ackman wanted to do fatty acid analyses on fat depots in the animals, so I had to go out and retrieve the animals from the officers—the fresher, the better. In another improbable assignment, I worked with Guillermo Napolitano, an Argentinian studying in Ackman’s laboratory. His project included analyzing the fat depots of the amphipod Corophium, which were to be collected from the sands exposed at low tide in the Bay of Fundy. Dr. Ackman indicated that we would need to collect 2 kilograms of these animals. When we reached the Bay, the scope of the problem was evident—we had to contend with the tremendous tidal reach for which the Bay is famous, and we were collecting very small animals (<11 mm long). With the two of us picking through the sand by hand and racing the rising tide, we collected about 100 g. We returned to the laboratory—and asked for mercy. Dr. Ackman reluctantly lowered the needed quantity to 1 kilogram—and subsequently we developed a sieving system to get the animals we needed. Yet another assignment in 1984 involved retrieving porpoises that had become stranded on the seashore and died. The initial report said there were two dead dolphins (subsequently correctly identified as porpoises), each about 2–3 feet long. Although Ackman had no project involving dolphins/porpoises at the time, he told me to go get them “in case we get a project.” He thought their brain tissue would be interesting to analyze for fatty acids or pollutants. I went to pick them up in my VW Rabbit, since the departmental truck wasn’t available at the time. The animals turned out to be 8 and 9 feet long. The SPCA was on the scene too, and I was able to persuade them to use their truck to help me bring back the larger animal to the laboratory—we just couldn’t store two. We managed to wrestle “Flipper” (as he came to be called) onto the elevator, which carried him up to the lab, and put the body in the walk-in freezer. A few days later, Ackman called me after a school tour had come through his laboratory, saying, “You just made a whole bunch of kids cry!” The children had seen the porpoise in the freezer and assumed that the workers in the laboratory were responsible for the animal’s death. After that, I built a “coffin” for Flipper so he wouldn’t be so obvious. Eventually the freezer died, and we transferred the body to yet another facility “in case we get a project.” In 1987, though, I finally disposed of it. My story of the porpoise reflects that Ackman was quite a saver—but his saving ways paid off many times. He would give me an assignment, and usually I could go to his storeroom and find just about everything I needed to assemble anything. He also saved reprints and journals and books. In his office, the only wall not covered with shelves overstuffed with paper was the one with the door out to the hallway. His desk was covered at least 2 feet deep in paper—but remarkably, he knew where everything was. And because of that, he did not want anyone to disturb his office. Ackman’s students didn’t have to go the library to look for a paper. All they had to do was ask him, and he would go straight to it in his office. Decades before omega-3 fatty acids were being promoted far and wide for a healthy heart, Robert Ackman was in his white lab coat at the Halifax lab of the Fisheries Research Board of Canada working on the technique that allowed fish oils to be isolated, understood and ultimately marketed to the masses. Read more from The Globe and Mail special by Susan Smith.